The world’s best badminton players converged on the Gold Coast Sports & Leisure Centre this week for the 2017 Total BWF Sudirman Cup, culminating in today’s finals competition between two of the sport’s powerhouse nations – China and Korea. Korea toppled the defending champions in a hotly-contested final day of competition, notching the win over China, who were playing for a record-breaking eleventh title. Korea last won the Sudirman Cup in the Netherlands in 2003, before China took out the next six consecutive events. The Korean team recorded the fastest smash of the competition with men’s singles player Son Wan HO recorded at a blistering 412 km/h, while Australia’s own Hsuan-Yu (Wendy) Chen clocked the fastest recorded women’s smash at 362 km/h. The closing day of competition was contested in front of a vocal, near capacity crowd, with the on-court action comprising men’s and women’s singles, men’s and women’s doubles, and mixed doubles. Also in the crowd were Queensland Minister for Tourism and Major Events, Kate Jones, Gold Coast Mayor Tom Tate, Australian Olympic Committee President John Coates, Gold Coast 2018 Commonwealth Games CEO Mark Peters, Badminton World Federation President Poul-Erik Hoyer Larsen and BWF and Badminton Australia representatives. “The atmosphere was electric at the final today – a big congratulations to Korea on their win. It was exciting to not only test out our brand new Commonwealth Games venue with a world-class international event, but to also have it broadcasting to half a billion households globally. Viewers will have gotten a great taste of some of what makes the Gold Coast so fantastic,” said Queensland Minister for Tourism and Major Events, Kate Jones. As part of the winner presentations this evening Minister Kate Jones officially handed over the host city flag to the next host city Nanning in China. “I think this event has absolutely raised the profile of badminton in Australia. All of the Korean and Chinese fans here today have been hash-tagging the event and spreading the word. It’s a wonderful event and sport, and it’s been great to see it all come together this week,” said Gold Coast Mayor Tom Tate. The top-tier international players in competition at the 2017 Total BWF Sudirman Cup included all-time-greats from the sport, current men’s and women’s world #1s (singles and doubles), as well as a large portion of the world’s top 10. Two-time Olympic champion, five-time world champion and former Dolce & Gabbana ambassador Lin Dan (China), along with current men’s singles world #1 Lee Chong Wei (Malaysia), world #2 Viktor Axelson (Denmark) and world #3 Jan O Jorgensen (Denmark), Chen Long (China) all took to the courts, as well as women’s singles world #1 Ying Tzu Tai (Taipei), world #3 Sindhu V Pursarla (India) and women’s doubles world #1 Misaki Matsutomo andAyaka Takahashi (Japan). The 14-player Australian team, that included some of the nation’s best-ever badminton talents, four Olympic athletes and a slew of young-guns had their best ever result in an international tournament finishing fifteenth overall and second in their group two division against teams such as the USA, Austria and Singapore. Taking place at Gold Coast Sports and Leisure Centre – the new sporting precinct for the 2018 Commonwealth Games – the prestigious event, including the BWF AGM, attracted more than 1,500 players and officials from over 160 countries, with an expected global television audience in excess of half a billion viewers. Supported by the Queensland Government through Tourism and Events Queensland’s It’s Live! 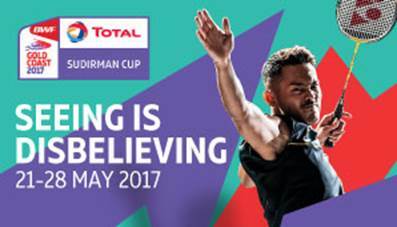 In Queensland calendar, the 2017 TOTAL BWF Sudirman Cup marks the first time the BWF has selected a non-European or Asian destination to host the globally-celebrated event since its founding in 1989.